Something all of us students are always looking for is trying to make quick and easy homemade meals which do not cost a lot of money! So today I'm sharing with you quick and easy pasta with a bolognaise sauce which you can put together for less than £7, serving four people in total. This uses Orgran Super Trio pasta which includes three super foods which you need in your diet. 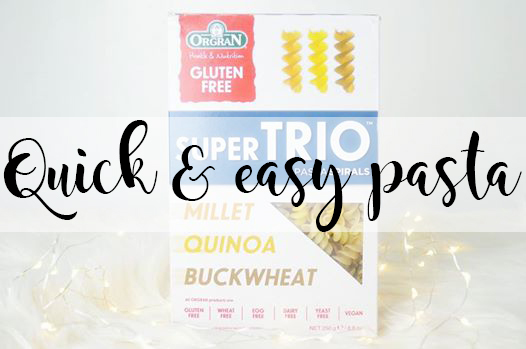 We all know Orgran is a gluten free company and that's what they are known for, however this pasta is also wheat, egg, dairy yeast and soy free and it's suitable for vegans and vegetarians too. So for £2.99 for a super food pasta which is free from nearly everything, it's definitely worth putting into your diet! Firstly prepare your onion, peel and cut into small pieces, then add the onion and mince meat to a saucepan. Cook both until onion has softened and mince meat has browned. Meanwhile, put the pasta into a saucepan, add boiling water and turn on; simmer once the water is boiling again. Add either the tin of tomatoes or tin of passata into the mince meat and onion; place on a low heat until at least half has gone (the tomatoes or passata will thicken). Once the sauce has thickened, add the basil and stir. Strain your pasta once it has softened, and the sauce and serve! It's really as simple as that; I'd show you pictures of how wonderful it looks but I got to carried away eating it, I forgot to take pictures! Let me know if you try this! And I hope you enjoy. This post features product(s) which I was sent for review purposes however all opinions are my own.